YOU ARE SPACE MERCENARY, CAPTAIN ASTRID TAM, TASKED WITH RESCUING THE SURVIVING MINERS STRANDED ON AN ALIEN-STRICKEN SUPER ASTEROID. YOU ARE THEIR ONLY HOPE. Made over 3 weekends for the June 2016 Godot Game Jam. 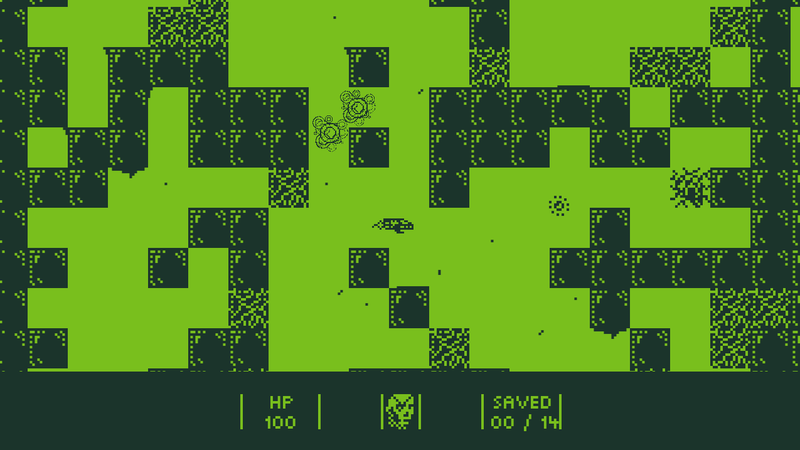 The theme of the jam was "procedurally-generated," with an optional theme of "two colors." The levels are all procedurally generated using, inspired by Spelunky, a system of layers of modules. This project, the first game I have made with Godot, was pretty fun! There are some parts that could use some polish, of course, but I'm happy with how complete it is for a game made in such short time. All art and everything made by me for the project. PLEASE NOTE: Linux and Mac versions are untested. Where did you learn how to do procedural generation? Great game, but it took me a bit to figure out you could shoot down those... uh, whatever walls they are. Very fun, and the procedural generation just added to it.